Ah, the joys of relationships! This is one area where there is such a variety. Whether it is with a spouse, child, sister, brother, mother, cousin or friend, there must be a relationship. Learning to be honest, open, trustworthy and connected are keys to healthy relationships. You may have experienced a time when youâ€™ve been surrounded by a room full of people and still felt lonely. Just because we are not literally alone, it sometimes feels as if we are. Many of us are never taught how to connect with people on an intimate level which leads to destructive, unhealthy relationships. As you learn to take care of yourself, gain inner confidence and set healthy boundaries, you will find that the level with which you relate to people will be more honest, trusting, deep and lasting. E5 Coaching has a motto â€“ â€œtreat others the way in which you would like to be treated.â€ It takes very little effort to see remarkable results. 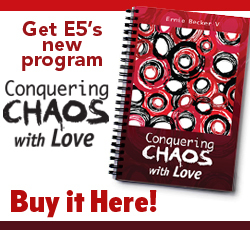 E5 Coaches build their client relationships on trust which is the foundation to all healthy relationships. In addition, our self-discovery program is designed to help you discover the â€œrealâ€ you.